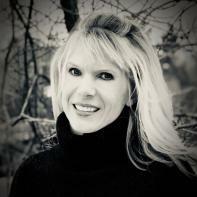 Amy Stonestrom is an MFA candidate in Bay Path University's creative nonfiction program. She is also part of the year-long Memoir Writer's Project intensive at the Loft Literary Center in Minneapolis. Her essays are published or forthcoming in Brevity, Storm Cellar, Jenny, Wanderlust Journal, and Montana Mouthful. Amy lives on the Minnesconsin border with her husband, son and springer spaniel. It’s four o’clock and the wind is lifting the snow off the ice in crystal sheets that glint in the low hanging sun. The snow is sharp when it hits the small amount of flesh on my face that isn’t layered in fabric. I reconsider the wisdom of begging Dad to let me go fishing with him after school. I probably should have stayed on the sofa curled up with my dog Krissy watching Hogan’s Heroes while eating Mom’s freshly made chocolate chip bars. Instead, I am standing here on the ice waiting for Dad to get the fish house ready. Before I can get in he needs to take the buckets, poles and auger out of the six-by-eight plywood structure and get the heat going. After that he will drill the eighteen-inch thick holes by hand with the ice auger. By the number of times he has said “Judas Priest” and “Cripes Almighty” I know there are problems lighting the old oil stove. My nose and my eyes are all that peer out of the grey fur that edges the hood of my powder blue coat. My scarf is wet with exhale and my toes start to complain in my mauve moon boots. Dad and I are the only ones out tonight and the sun is starting its rapid decent behind the black tree trunks at the edge of the lake. The ice cracks and sings like a saw harp underneath me. I can’t ask Dad if the ice will hold us even though on the news every winter we see trucks and cars that fall in—the drivers too. He’s lived in Minnesota his entire life and he’s told me dozens of times that if he knows anything he knows when he can and when he can’t drive on the ice. He trudges out in his brown work boots, his earflaps down, and props me up on the east side of the fish house next to the ice auger. “Stay here out of the wind,” he says wiping his nose with a blue paisley handkerchief. Dad always has Luden’s honey cough drops, toothpicks and a pen in his front shirt pocket. His handkerchief, a pocket knife and worn leather wallet are kept in the pocket of his jeans or coveralls. Today he also carries wax worms in a clear disk in his flannel shirt pocket, against his heart, so they don’t freeze. I’m glad for the shelter because the wind really kicks in now. Pellets of hard snow race toward the boat landing three hundred yards east. I push my back closer to the plywood as the ice groans again under my feet. We call this Crooked Lake but you won’t find it on a map—that’s just its nickname. It has different sections and narrows, a way back secret spot too filled with cattails, lily pads and jumping fish that you can only reach during the spawn. In the summer when I get really bored in the yellow boat, nothing’s biting, I like to take a few leeches out and let them attach to my hand. Or I dig around in the Folgers coffee can filled with dirt and angle worms that we dug from the garden by the raspberry patch. Now we are on the north section. Last August I caught a large-mouth bass in this part but closer to shore. Dad told everyone about it for a week. “Amel caught herself a whopper. Five pounds at least.” (He could have said six to make it sound better but Dad doesn’t embellish nor does he like an embellisher.) This also the exact place where Dad saved the dog with the dip net after she jumped into the lake to see our friend Jerry in another boat. Dad’s rods and reels are the closet thing he has to a rifle—hooks are the nearest thing to bullets. My friends’ dads and my uncles and my brother all have at least one shotgun for bird hunting and a rifle for deer hunting but not Dad. He’s never hunted. Although he doesn’t say why, I already know. It’s because he could never put a bullet into anything with feathers or fur. True, he bashes fish in the head against the side of the boat so they don’t flop around and splatter blood and slime all over and so he can save the hook and the bait from their greedy bellies. Also true, it is his job—our bread and butter—to trailer livestock from the area farms to the stockyards for slaughter. Giving an animal a ride to its last dance is one thing. But I could never imagine Dad pulling the trigger as a deer leapt across a corn field and emptying its guts there for the fox and coyotes in the stubble of old yellow stalks. I know this about Dad because in July, when it’s sweltering hot, he drags an extension cord out the back door of the kitchen and runs it across the lawn thirty feet to the garage where he hoists a box fan up in ropes tied around the rafters. He points the fan directly toward the mud nest in the peak of the roof where baby barn swallows lurch and pant. Sometimes it is so hot they jump to their death, featherless, just little bent v-shaped bones for wings. Or mama bird has to toss the suffocated body out. A tiny pile of grey fuzz and yellow beak on the concrete floor is all that’s left when I go to check on them in the morning. After the fan is in place he gets an extra length of green hose and a ladder and secures the hose on top of the roof. Then he yells “Ok Amel” from the ladder and I crank the spigot so cold water can cool the asphalt shingles. It isn’t a tidy process but it usually saves every bird in the nest. Dad might love conserving water and electricity even more than fishing. He uses a headlamp or flashlight to go down to the basement and gives me the business if I leave the water on or stand in front of the fridge for a moment or two. But no resource is spared for our little panting birds. Dad is deaf in his left ear from when he fell off a flatbed truck as a kid. When he was drafted, the Army sent him back home from Fort Snelling after his physical exam. “They didn’t want me for Korea.” He says this whenever he tells the story and he sounds a bit like I feel when someone doesn’t pick me for their team at recess. I always thought it was probably good that they didn’t want him. There wouldn’t have been a long enough extension cord or length of hose to save everything there. Minutes pass as the sun melts like orange sherbet into the cotton candy horizon. I can hear Dad clunking around against the thin wall behind me yelling out his fercryingoutlouds and his Judas Priests. The wind blasts again but this time it doesn’t blow straight like it’s supposed to. This time it takes an icy arm and hooks in around the fish house and grabs the ice auger toppling it over on me. Its big spiraled blade collides into my head. Dad hears the screaming and rushes out to see the auger laying horizontal on the ice and me holding my hooded head, face frozen with snot and tears. He picks me up tosses me in the cab of the truck and then goes around to the driver’s side to start it. When I remove my mittens and examine the wound my hand is wet. I look and see that it is red too. My hood has a small rip but the knit stocking cap is in one piece, not cut through. The big tassel at the top of my hat took the worst of the fall. I watch Dad out the window rushing to turn off the stove, throw the auger, the jig poles, the dip net and five gallon pails in the fish house and padlock the door. I haven’t seen him move this fast before. Dad jumps back into the cab of the green Chevy and we drive to the landing on the plowed icy path. He holds his used paisley handkerchief tight against my head as I sit close against him on the bench seat. “Da-ad, don’t.” He’s always trying to ruin a good cry with his joking around. The snow squeals and crunches under the tires and the pickup wobbles as it climbs the landing. He tells me that heads cut easy but he thinks I’m going to be alright by tomorrow. My sister and brother both sliced their heads open too, twelve maybe fifteen years ago, when they were my age. Now I’ll have a story for them. “Tim ended up needing stitches,” he says. “Was that your fault too?” I say. He laughs and leans into me with his shoulder and says no he didn’t think so. Dad whistles out a sigh. We both know he is going to be in trouble with Mom for putting me next to an upright ice auger and I’m not sad about that. He sits on the gravel at the stop sign for a bit as if considering which way to turn onto the snow crusted tar. I wonder if he’s thinking about taking a right and driving to the the emergency room or just pausing because he’s scared of showing Mom my head. Then he turns left toward home. “I’s sorry Tyker. I should have had you stay in the truck.” He only says “I’s sorry” when he is very sorry and he only calls me Tyker when I’m wrapped around the dog sleepy on the sofa or when I am sick. Like the lake, I have a few different names. “I’m sorry we didn’t catch any fish,” I say. An empty fish pail means we were skunked tonight. We didn’t even wet a line. Walleye—dipped in egg and crushed soda crackers fried up by Mom on the stove—would have tasted good tonight. We drive north. Dad is still pressing the handkerchief tight to my head as he hums an old tune. I lean against his green coveralls inhaling fuel oil and stale cigars. The last of the sun spills russet orange into the purple sky as the headlights from snowmobiles zigzag next to us on the banks of the ditch. I’m thinking that if it weren’t for my throbbing head, it would have been a pretty good trip.